Bitcoin is back above 4000 and the Chinese exchanges and it looks as though the we saw over the last four weeks was temporary, fear driven selling. Sentiment looks to be strengthening and it looks to it's paving the way for some positive news to compound the recovery and really get things moving to the upside once more. Markets just learned that Argentina is set to make a play in the bitcoin and blockchain space and – as something of a nice reprieve from the recent bout of negative news – it's a strong, crypto-supportive play at that. 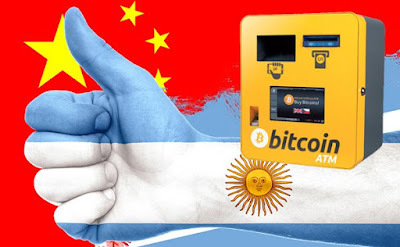 This week, reports hit press that Argentina would be getting around 250 bidirectional ATMs as soon as next month – ATMs that are designed to facilitate both transactions in fiat currency and, you got it, bitcoin. The company that is setting them up is called Odyssey Group and the announcement came by way of an interview with Odyssey CEO and founder Sebastián Ponceliz. According to Ponceliz, almost immediately after installation, the ATMs will be able to handle transactions in bitcoin, but also Ethereum and Litecoin. Further, they are set up so as to allow for additional coins to be added to the mix over time, with these additions based on general popularity for the claims in question. Once the initial Argentinian machines are in place, Odyssey has suggested that it will seek to expand into other areas in and around Latin America and Mexico, as well as potentially Europe if the initial rollout is a success. This isn’t the first ATM news we have had in September – just last week, we learned that an Australian company is set to launch as many as 2500 bidirectional ATMs across Australia at the start of next year. It's looking like, against the backdrop of Chinese indecision as to regulatory action, for the nations around the world are acting swiftly to adopt bitcoin and its buying technology – surely a good thing for the space as a whole. iCryptocurrency Says "JOIN BITCONNECT" AND "JOIN Regalcoin" TODAY!!! Support our broadcast. We appreciate your donations and helping hands.